“Our Historian of the Year for 2018 is probably one of the most well-known people in this room today. He is known throughout the State, Country and probably Internationally. He doesn’t produce in depth historical nor genealogical studies; however, he does and continues to do more to “tempt” people to do so than they are willing to admit. It starts with an idea, a suggestion…which promotes curiosity…which encourages research and interviews, that stirs more ideas…and then the creativity kicks in. The result is a show that appeals to many, many people from all walks of life and on every educational level. His magical, endearing personality gets people to talk, to share their family history, details of their special craft of hobby. He is there when history is revived, and he is there when history is about to be made…all the while, capturing and sharing these special times with us via weekly shows, a successful syndicated column, a newly released [podcast], and amazing website that houses the collection of weekly shows…just in case you’ve missed an edition…now it has taken on a life of its own. In writing this narrative about our Historian of the Year, I visited this website to take a few notes to add to the ones I had been provided with. I thought that I would devote about 5 or 10 minutes to this search and before I knew it, I was being called down from my office as my husband had fixed LUNCH! I had been on the site for over 4 HOURS! Needless say, I learned a LOT! 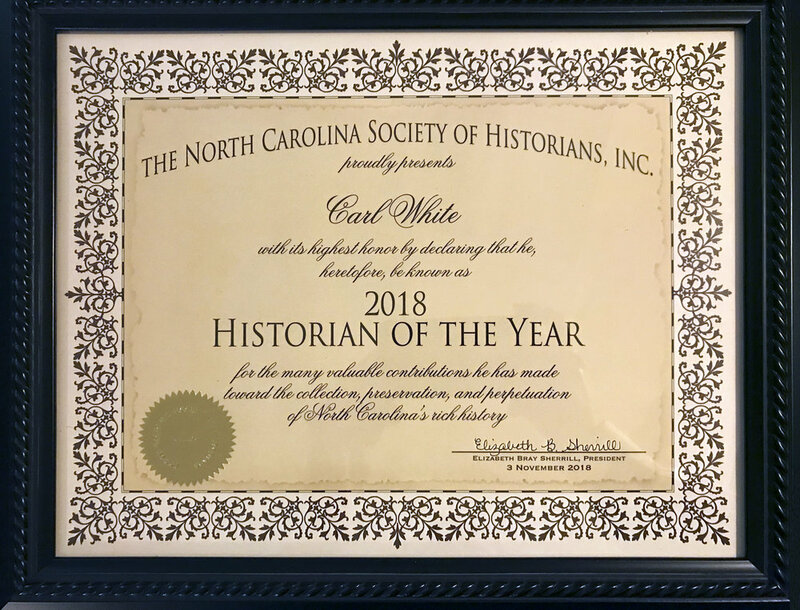 `-Elizabeth Bray Sherrill, President of the North Carolina Society of Historians (NCSH), Inc.
"The Collectors" is an episode of Carl White's Life in the Carolinas. In this episode Carl takes viewers on a fascinating day trip in a 1946 Chevy, traveling from Wilkes County to Salisbury, with a stop in Pilot Mountain. He is joined by his friend Ken Welborn, publisher of The Record in Wilkesboro and a passionate connoisseur of collectables. Their mission? To find and deliver a unique gift for Carl's friend, bluegrass musician and collector extraordinaire Tom Isenhour. For valuable contributions make toward the collection, preservation, and perpetuation of North Carolina history. "Remembering No More" is a special episode of Carl White's Life in the Carolinas. In this special episode, Carl explores Alzheimer's Disease. Focusing on the story of Vera, a gracious lady who suffers with Alzheimer's, he explores the disease, how it impacts on patients and those who love the patients, and the efforts of the many men and women who are working to eradicate this devastating disease. "The American Legion World Series" is a special episode of Carl White's Life in the Carolinas. In this episode, Carl takes viewers to Shelby,NC where he highlights the history, volunteers and the excitement of the American Legion World Series.